Stockholm is one of the most beautiful cities in the world with an ambiance and charm you’re hard-pressed to find anywhere else. It’s an amazing amalgam of modern and medieval, land and sea, built on 14 islands and connected by 57 bridges. The city is stunning, most people speak English and, best yet, many of its attractions are easily reached by foot. 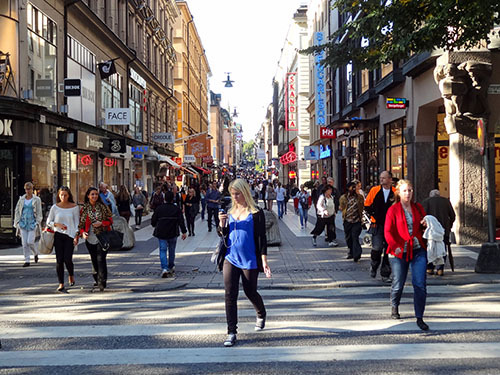 Those not within walking range are linked by a modern transportation system that gets you there comfortably and quickly, although many Stockholmers ride their own bicycles. While the city is more expensive than many other European cities (although it’s cost of living is closer to that of Paris than Geneva) it doesn’t have to be as expensive as some might think. 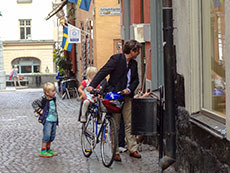 There are many ways you can economize in Stockholm, especially on food and drink. Another good way is to purchase the Stockholm Card. While at SEK 675, (approximately $91 per adult for two days) the card may appear expensive, the card provides free admission to more than 80 museums and attractions as well as free travel on all public transport, a great savings. You can use the card to get to and into many of the sights and attractions I’ve listed below. 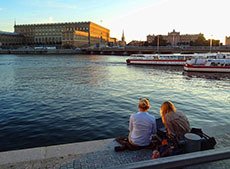 Although the following list is a highly curated it should help you make the best use of your time during a three-day visit to Sweden’s beautiful capital city, one of the top 10 most popular destinations in Europe. Gamla Stan, the Old City, is Ground Zero for tourists in Stockholm and one of the best-preserved medieval places in Europe. It’s a fantastic area, one of the great treasures of Sweden. It’s home to the 608-room Royal Palace, the largest in Europe, although the Royal family no longer lives here but in Drottningholm Palace about seven miles outside of town. 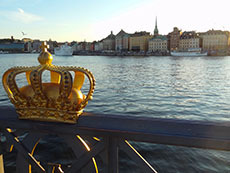 Still though, the changing of its guard continues to be one of Stockholm’s most popular attractions. 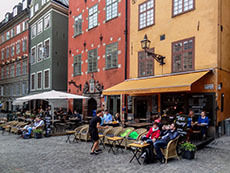 You could spend an entire day wandering the cobbled streets and alleyways here, browsing in boutiques and antique shops, lunching in a restaurant or café, or enjoy a fika, better known as a Swedish coffee break. Also on Gamla Stan is the Nobel Museum on Stortorget, the city’s picturesque old square. Housed in the old Stockholm Stock Exchange, it’s a fascinating place that not only has displays about the recipients of the Nobel Prize over the years, but also a number of wide-ranging exhibits on such things as the five colors of peace and the origin of the peace symbol itself (actually the logo of the Campaign for Nuclear Disarmament). After visiting the Nobel Museum you could also walk over to nearby City Hall, a huge building on the harbor that took eight million red bricks to build, making it hard to miss. City Hall is the venue for the Nobel Prize Award dinner that’s held every December. 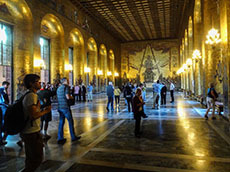 Take the interesting 45-minute guided tour of City Hall and you’ll be impressed, especially in the Golden Hall, where the walls are covered with more than 18 million pieces of gold and glass mosaics, ranking it high on the “wow!” factor. The large scenes in the Byzantine-inspired mosaic depict events in Swedish history. You’ll find old river boats moored near City Hall that can take you to Drottningholm Palace, home of the Royal Family; it’s a 45-minute comfortable river cruise that’s well worth it. When built in 1628 the Vasa was a huge warship, about 226 feet long, weighing more than 130 tons and designed to carry 145 sailors and 300 soldiers. After sailing barely ¾ mile on its maiden voyage, Vasa heeled over and sank in the middle of Stockholm harbor. 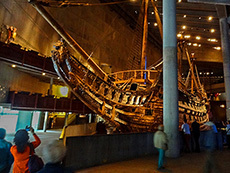 After being salvaged in 1961, and painstakingly restored over the next 17 years, the Vasa is now housed in its own museum, the Vasa Museet, on the island of Djurgården. Sans its paint, it looks almost exactly as it did on its maiden voyage and is the only almost fully intact 17th-century ship ever salvaged. There’s no other museum like this anywhere else in the entire world. See it. You’ll find it on the harbor shore, almost hidden behind the Nordic Museum, reached via tram #7. After leaving the Vasa you can continue on the tram to Skansen, Stockholm’s zoo and fascinating open-air museum, the world’s oldest. Filled with 150 historic buildings brought there from all over Sweden, the museum is a great place to enjoy a view of traditional Swedish life prior to the industrial age. You’ll be amazed at how meticulously everything is brought together here…the cobblestone streets, a wagon on the side filled with barrels and luggage, little shops with people in costume so willing to talk with you. I dropped into a small bakery and chatted with the rotund baker who showed me the things they’d been making. Ten minutes later I was walking down a cobblestone lane watching geese cross into a garden up ahead. It’s a fascinating place, too-often overlooked by travelers and can fill a good half-day of wandering about. One of my favorite places to visit is Skeppsholmen, a small-ish island between Djurgården and Gamla Stan. No tram runs through here and you reach the island by walking across Skepps-holmsbron, a bridge adorned midway with a large gilded crown that people rub for good luck. 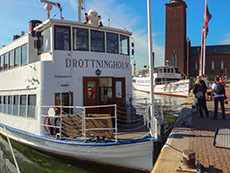 The bridge is quite popular, both because it’s the link between the National Museum on the “downtown” side and the Moderna Museet, the Museum of Modern Art, on the island. It’s a wonderful place both inside and out but even it you don’t visit the collections inside, be sure to take a walk around the exterior to view the colorful fountains and sculptures. Then continue on along the shore line to view the boats moored there, as well as to have a superb view of Gamla Stan and the harbor, especially good at sunset. After leaving Skansen or the Vasa Museum take tram #7 back downtown. As the tram crosses the bridge and runs along the shoreline you’ll be traveling on the Strandvägen, Stcokholm’s answer to New York’s Fifth Avenue. You’re now entering the neighborhood of Östermalm, an area that’s a smorgasbord of upscale boutiques and outdoor cafés and is great for an afternoon of wandering. 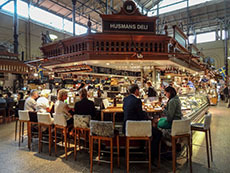 While you’re in Östermalm be sure to visit the Östermalm Food Hall, a great Old World food hall set inside a beautiful old medieval brick building (see Five Fantastic European Food Halls for Splurging). Inside are butchers, fishmongers, delis and cafes, as well as several restaurants and plenty of purveyors of gourmet products. It’s a delicious, colorful place (some good free samples, as well) and while you’ll find some foodstuffs there from Italy, Spain and Beirut, for the most part it’s Swedish. Bring an evening to a close by visiting the popular Ice Bar in the Nordic Sea Hotel near the central train station. 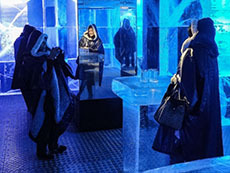 The place is exactly what the name implies: a bar totally made of ice with the exception of the floor and ceiling, where the temperature is kept at a constant -5˚C/23˚F. Even the glasses from which you drink are made of ice. The cost of entry is SEK 190 per person (about $25), which entitles you to one drink plus a parka and gloves (both are rentals and only for use in the bar). It’s fun and very popular, and good fodder for cocktail-party chitchat back home. Have you done anything on air/cruise port parking (I see a coupon below). We are sailing out of Port Everglades in Feb and parking at the Embassy Suites for 7 days for $27.37! They gave us an extra $1 off per day because we had over 6 cars. Last year I paid $46! No I haven’t done anything on air/cruise parking but that’s a good idea for an article. I hope that $27 is for the week and not per day! We visited both the Vasa Museum and Ice Bar. The museum was very interesting, even for children. The Ice Bar was fun and, as you said, good fodder for conversations. Stockholm is fanstatstic in the spring. My family and I try to visit Stockholm at least once a year. My daughter loves to visit the Museum of Natural History (http://en.wikipedia.org/wiki/Swedish_Museum_of_Natural_History) and of course Gröna Lund. If you plan to visit Stockolm, do it in the summer or the spring, it´s so much nicer than in the winter or the fall! You’ll love Stockholm. In July be prepared for some long days and very short nights.